In this interview, News Medical talks to Dr. Carly Ross, from Beckman Coulter Life sciences about extracellular vesicle isolation and characterization. What are extracellular vesicles (EVs)? Please can you outline the three main types of EVs? Extracellular vesicles are membrane surrounded structures released by cells in an evolutionally conserved manner. There are three main types of EVs, Exosomes (50-100 nm), Microparticles (200 nm-1 um) and Apoptotic bodies. What size particles can be analyzed using flow cytometry? Un-labeled small particle detection via flow cytometry is based on the forward and side scatter capabilities of the instrument. The MoFlo Astrios EQ can measure 80 nm polystyrene particles on side scatter. What are the benefits and challenges of using polystyrene beads as a calibration standard and how do they compare to using DiI stained liposomes, purchased exosomes or electronic pulser? Using polystyrene beads as the instrument calibration standard provides uniform standardized particles, easily accessible for most researchers and the particles have little variation lot to lot. However, their index of refraction is much higher than EVs, so a biological particle such as a liposome, stained or unstained, would be an excellent choice for EV application development. Liposomes have a much lower index of refraction (RI) (1.40) and therefore are near the EV RI of approximately 1.37. Another effective calibration standard is to purchase EV that have been already characterized and confirmed. The EVs are biologically relevant, match the index of refraction, mass and density and are effective for developing application and instrument settings. These particles, however, may be costly, have higher variation in populations and the precipitation reagent may cause downstream analysis or functional issues. The electronic pulser is used not as a particle analyzer, but as a method of testing the instrument sensitivity and background. It is effective in determining if the instrument could detect EV by the photonic sensitivity. Please can you give an overview of the MoFlo Astrios EQ? 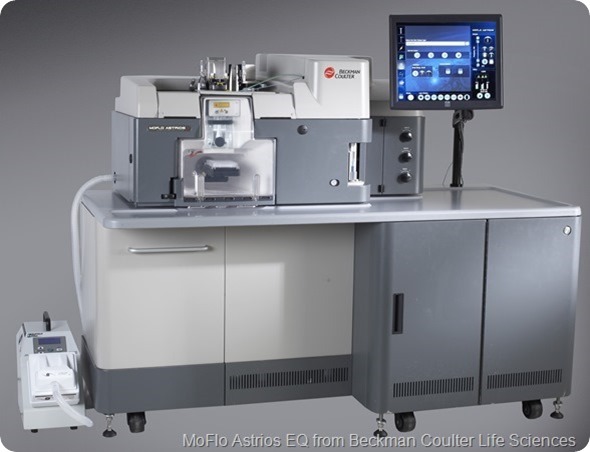 The MoFlo Astrios EQ is a 7-laser, 7 pinhole high speed cell sorter capable of detecting polystyrene particles 200 nm on forward scatter and 80 nm on side scatter. What are the main technologies used for EV isolation? The gold-standard for EV isolation is a serial centrifugation using an Optima XPN Beckman Coulter ultra-centrifuge that allows for up to 100K g on the sample. There are other methods such as size exclusion column or precipitation methods that may be used as well. According to research, how does ultracentrifugation compare to precipitation? The UC with the optiprep gradient provided highest purity exosomes with high yield with the UC providing second highest yield. Although more labor-intensive the UC methods both provided better EV isolation methods. How does flow cytometry compare for EV isolation? What controls should be used? Researchers use flow cytometric sorting for single EV isolation for high purity but lower yield than UC. Several controls are required to confirm that the visible population contain EVs; including, sample media, unstained EVs, stained EVs, Stain solution with no EVs as well as fluorescence and scatter calibration standards. Following isolation, what are the main methods used for analyzing EVs? Researchers first determine the protein concentration (BSA assay), then antibody confirmation (i.e. CD63) using either western blot or capture beads. The populations are also characterized by size and dispersity using dynamic light scatter (DLS) Delsa Max and finally a high resolution analysis by either nanotracking analysis or analytical ultra-centrifugation. Please can you give an overview of dynamic light scattering and analytical ultracentrifugation? How can these be used to characterize EVs? Dynamic light scatter measures the intensity of the light scattered by the EVs in the sample as a function of time. The system provides the average size, size distribution and polydispersity of the sample. DLS is used for initial EV population measurements. Analytical ultra-centrifugation (AUC) is typically used for quantitative analysis of macromolecules of a solution (including protein aggregation, antibody purity determination and mass). As the ultra-centrifuge spins at 60K rpm, macromolecules are separated by their sedimentation velocity and characterized by their absorbance and refractive index characteristics. AUC separates EV populations based on molecular mass, lipid and protein composition, and size. What do you think the future holds for extracellular vesicle isolation and characterization? Further development of analytical measurements of EV populations and subpopulations as well as the ability to separate those populations will great enhance researchers’ capabilities. Readers can navigate to www.beckmancoulter.com for more information. Carley Ross is a Staff Development Scientist from Beckman Coulter Life Sciences Research and Development since 2008 and aiding in the development of the MoFlo Astrios and Astrios EQ as well as her current work on the analytical ultra-centrifuge. She has been awarded two patents, one in flow cytometric sorting and the other for EV work on the AUC. In addition, she has been awarded the corporate Excellence in Values for her work ethic and two Excellence in Innovation for her collaborative work on projects for the Astrios. Dr. Ross received her Ph.D from Colorado State University from the Cell and Molecular Biology program with a focus on Mammalian Mutation Assays on a flow cytometer. She then did post-doctoral work in biochemistry by studying the development of yeast prions with a focus on molecular and protein science. Dr. Ross’ focus is to bring Beckman Coulter’s technology to the cutting edge with small particle detection of extracellular vesicles on both the flow cytometry and AUC platforms.